熊盛青, 杨海, 丁燕云, 李占奎. 2018. 中国航磁大地构造单元划分[J]. 中国地质, 45(4): 658-680. XIONG Shengqing, YANG Hai, DING Yanyun, LI Zhankui. 2018. 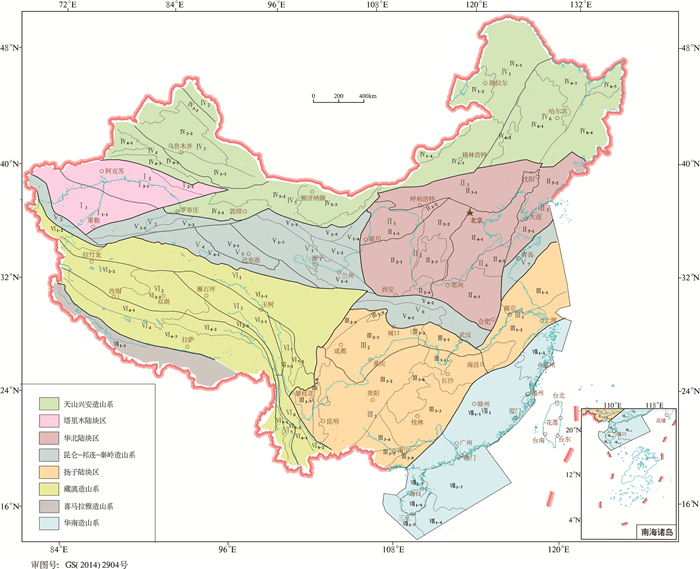 Subdivision of tectonic units in China based on aeromagnetic data[J]. Geology in China, 45(4): 658-680. (in Chinese with English abstract). About the first author: XIONG Shengqing, male, born in 1963, senior engineer and supervisor of doctor candidates, mainly engages in application of aero geophysics, remote sensing technology in geosciences; Email: xsq@agrs.cn. Abstract: This research is based on the compiled aeromagnetic map of China that almost covers whole China's continent and part of China's sea areas since 2011 and the magnetic features and fluctuation of magnetic basement reflected by these maps. Learning from subdivision idea of mainstream tectonic views, guiding by theories of plate tectonics and continental dynamics, and taking the tectonic features reflected by magnetic field as key points, in combination with gravity, remote sensing and geological data, the authors divided the tectonic setting of China into four levels. Eight first-order tectonic units include continental block domains and orogenic systems; thirty-two second order tectonic units include continental blocks, arc-basin systems and land mass; eighty-five third order tectonic units include basins, depression belts (areas), and uplift belts (areas); three hundred and thirty-two fourth order tectonic units include uplifts and depressions. This subdivision provides basic geophysical data for geological and tectonic background research and oil gas exploration. In this paper, the authors discussed the magnetic evidence for delineating boundaries of the first and second order tectonic units, and compared them with previous subdivision of tectonic units in China. The third and fourth order tectonic units were completely defined by the feature of magnetic field and fluctuation of magnetic basement. The magnetic basement depth of basins and depression areas are provided in this study, which provides the necessary technical support for oil and gas prospectors. Meanwhile, aeromagnetic anomalies show some special characteristics that are not consistent with observed geological and tectonic features, which provide raw data for discussion of tectonic features of China. Cheng Yuqi. 1994. An Introduction to Regional Geology in China[M]. Beijing: Geological Publishing House (in Chinese). He Rizheng, Gao Rui, Zheng Hongwei, Zhang Jisheng. 2007. Matched-filter analysis of aeromagnetic anomaly in mid-western Tibetan Plateau and its tectonic implications[J]. Chinese Journal of Geophysics, 50(4): 1131-1140 (in Chinese with English abstract). Huang Jiqing, Ren Jishun, Jiang Chunfa, Zhang Zhengkun, Qin Deyu. 1980. The Geotectonic Evolution of China[M]. Beijing: Science Press (in Chinese). Li Chunyu, Wang Quan, Liu Xueya, Tang Yaoqing. 1982. Tectonic Map of Asian (1:8, 000, 000)[M]. Beijing: Geological Publishing House (in Chinese). Li Siguang. 1973. Introduction to Geomechanics[M]. Beijing: Science Press (in Chinese). Liu Shoupeng. 1989. Aeromagnetic Anomaly Map of China and Its Adjacent Sea Area (1:4000, 000)[M]. Beijing: Sino Maps Press (in Chinese). Pan Guitang, Xiao Qinghui. 2015. Explanatory Note to the Tectonic Map of China (1:2, 500, 000)[M]. Beijing: Geological Publishing House (in Chinese). Pan Guitang, Xiao Qinghui, Lu Songnian, Deng Jinfu, Feng Yimin, Zhang Kexin, Zhang Zhiyong, Wang Fangguo, Xin Guangfu, Hao Zhiguo, Feng Yanfang. 2009. Subdivision of tectonic units in China[J]. Geology in China, 36(1): 1-28 (in Chinese with English abstract). Qu Guosheng, Wang Shengzu. 1997. Aerial magnetic anomalytectonic interpretations in mainland continent and their adjacent seas of China[J]. Scientia Geologica Sinica, 32(4): 455-464 (in Chinese with English abstract). Ren Jishun, Wang Zuoxun, Chen Bingwei, Jiang Chunfa, Niu Baogui, Li Jintie, Xie Guanglian, He Zhenjun, Liu Zhigang. 1999. Chinese Tectonics from a Global View-instruction of Tectonic Map of China and Adjacent Regions[M]. Beijing: Geological Publishing House (in Chinese). Wan Tianfeng. 2011. 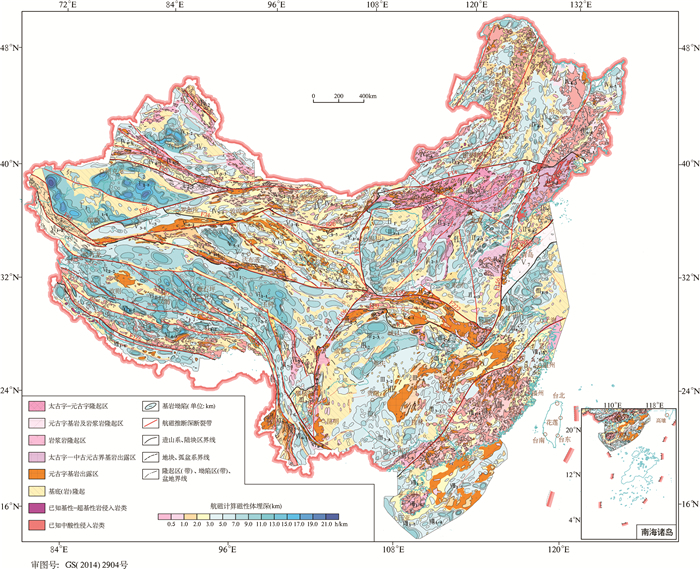 The Tectonics of China-Data, Maps and Evolution[M]. Beijing: Geological Publishing House (in Chinese). Wang Defa, Wang Naidong, Zhang Yongjun, Zou Weilei, Zhang Derun. 2013. Aeromagnetic Series Maps and Its Explanatory Note in Qinghai-Tibet Plateau and Adjacent Area[M]. Beijing: Geological Publishing House (in Chinese). Wang Tao, Xu Mingjie, Wang Liangshu, Liu Shaowen, Hu Xuzhi. 2007. Aeromagnetic anomaly analysis of Ordos and adjacent regions and its tectonic implications[J]. Chinese Journal of Geophysics, 50(1): 163-170 (in Chinese with English abstract). Wang Youxue, Jiang Mei, Xiong Shengqing, Xue Ddianjun, Wittlinger G, Paul A. 2006. Delamination of the lithosphere below the West Kunlun and its tectonic implications-evidence from Seismic tomographic images and aeromagnetic anomalies[J]. Geologly in China, 33(2): 299-308 (in Chinese with English abstract). Xiong Shengqing, Ding Yanyun, Li Zhankui. 2012. Characteristics of gravity and magnetic field in Xizang (Tibet) and new understanding on tectonic framework in Eastern Xizang[J]. Geological Review, 58(2): 201-207 (in Chinese with English abstract). Xiong Shengqing, Ding Yanyun, Li Zhankui. 2015a. Map of Magnetic Basement Depth in Chinese Continent (1:2, 500, 000)[M]. Beijing: Geological Publishing House (in Chinese). Xiong Shengqing, Ding Yanyun, Li Zhankui. 2015b. Map of Regional Structure in Chinese Continent (1:2, 500, 000)[M]. Beijing: Geological Publishing House (in Chinese). Xiong Shengqing, Fan Zhengguo, Zhang Hongrui. 2013. Series Map of Aeromagnetic in Chinese Continent and Its Explanatory Note(1:5, 000, 000)[M]. Beijing: Geological Publishing House (in Chinese). Xiong Shengqing, Fan Zhengguo, Zhang Hongrui. 2015c. Series Map of Aeromagnetic in Chinese Continent and Its Explanatory Note(1:2, 500, 000)[M]. Beijing: Geological Publishing House (in Chinese). Yang Hua, Liang Yueming. 2013. Nationwide aeromagnetic δT anomalies and China's geoscience block structures[J]. Geophysical and Geochemical Exploration, 37(6): 957-967 (in Chinese with English abstract). Zhang Changda. 2013. Research on Development of Magnetism and Time Domain Electromagnetic Method[M]. Wuhan: China University of Geosciences Press (in Chinese). Zhang Jiangsheng, Lao Qiuyuan, Li Yan. 1999. Tectonic implication of aeromagnetic anomaly and evolution of Huabei-South TarimYangtze superlandmass[J]. Earth Science Frontiers, 6(4): 379-390 (in Chinese with English abstract). Zhang Wenyou. 1986. Tectonics of Land and Sea in China and Its Adjacent Area[M]. Beijing: Science Press (in Chinese). Zhu Ying. 1989. Some geotectonic problems around eastern margin of the Tarim Basin[J]. Chinese Journal of Geophysics, 32(4): 399-408 (in Chinese with English abstract). Zhu Ying. 2013. 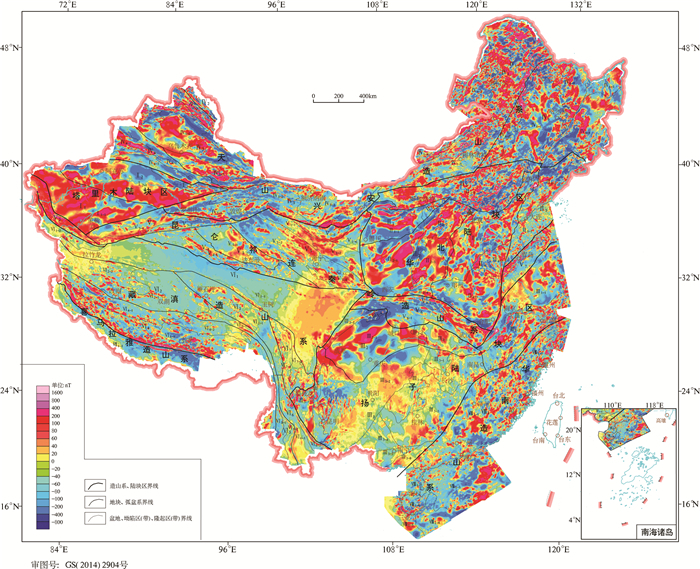 Tectonic and Deep Structure of China and Its Adjacent Area-preliminary Interpretation of Aeromagnetic Map of China(1:1000, 000)[M]. Beijing: Geological Publishing House (in Chinese). 程裕淇. 1994. 中国区域地质概论[M]. 北京: 地质出版社. 贺日政, 高锐, 郑洪伟, 张季生. 2007. 青藏高原中西部航磁异常的匹配滤波分析与构造意义[J]. 地球物理学报, 50(4): 1131-1140. 黄汲清, 任纪舜, 姜春发, 张正坤, 秦德余. 1980. 中国大地构造及其演化[M]. 北京: 地质出版社. 李春昱, 王荃, 刘雪亚, 汤耀庆. 1982. 亚洲大地构造图(1:800万)[M]. 北京: 地质出版社. 李四光. 1973. 地质力学概论[M]. 北京: 科学出版社. 刘寿彭. 1989. 1:400万中国及其毗邻海区航空磁力异常图[M]. 北京: 中国地图出版社. 潘桂棠, 肖庆辉. 2015. 中国大地构造图(1:250万)说明书[M]. 北京: 地质出版社. 潘桂棠, 肖庆辉, 陆松年, 邓晋福, 冯益民, 张克信, 张智勇, 王方国, 邢光福, 郝国杰, 冯艳芳. 2009. 中国大地构造单元划分[J]. 中国地质, 36(1): 1-28. 曲国胜, 王绳祖. 1997. 中国大陆及邻近海域航磁——大地构造解释及分区[J]. 地质科学, 32(4): 455-464. 任纪舜, 王作勋, 陈炳蔚, 姜春发, 牛宝贵, 李锦铁, 谢广连, 和政军, 刘志刚. 1999. 从全球看中国大地构造——中国及邻区大地构造图简要说明[M]. 北京: 地质出版社. 万天丰. 2011. 中国大地构造学[M]. 北京: 地质出版社. 王德发, 王乃东, 张永军, 邹为雷, 张德润. 2013. 青藏高原及邻区航磁系列图及说明书[M]. 北京: 地质出版社. 王涛, 徐鸣洁, 王良书, 刘绍文, 胡旭之. 2007. 鄂尔多斯及邻区航磁异常特征及其大地构造意义[J]. 地球物理学报, 50(1): 163-170. 王有学, 姜枚, 熊盛青, 薛典军, Wittlinger G, Paul A. 2006. 西昆仑岩石圈的拆沉作用及其深部构造含义——地震层析成像及航磁异常证据[J]. 中国地质, 33(2): 299-308. 熊盛青, 丁燕云, 李占奎. 2012. 西藏地区重磁场特征及藏东构造格局新认识[J]. 地质论评, 58(2): 201-207. 熊盛青, 丁燕云, 李占奎. 2015a. 中国陆域磁性基底深度图(1:250万)[M]. 北京: 地质出版社. 熊盛青, 丁燕云, 李占奎. 2015b. 中国陆域区域构造图(1:250万)[M]. 北京: 地质出版社. 熊盛青, 范正国, 张洪瑞. 2013. 中国陆域航磁系列图及说明书(1:500万)[M]. 北京: 地质出版社. 熊盛青, 范正国, 张洪瑞. 2015c. 中国陆域航磁系列图及说明书(1:250万)[M]. 北京: 地质出版社. 张昌达. 2013. 重磁与时间域电磁法发展趋势研究[M]. 武汉: 中国地质大学出版社. 张家声, 劳秋元, 李燕. 1999. 航磁异常的构造解释和华北-塔南-扬子超陆块演化[J]. 地学前缘, 6(4): 379-390. 张文佑. 1986. 中国及邻区海陆大地构造[M]. 北京: 科学出版社. 朱英. 1989. 塔里木盆地东缘的若干大地构造问题[J]. 地球物理学报, 32(4): 399-408. 朱英. 2013. 中国及邻区大地构造和深部构造纲要——全国1:100万航磁异常图的初步解释[M]. 北京: 地质出版社.